Slate roof tiles are a fantastic roofing material, ideal for any type of property. Endowed with a number of excellent natural properties, these tiles are the material of choice for many buildings. As premier slate suppliers, All Slates are proud to offer an extensive range of reclaimed roofing tiles to suit any specific size or style requirement. We aim to provide our customers with a cost effective service too, and thanks to our wide range of reclaimed roofing tiles, we can offer something to suit an array of physical specifications and budgets. We also offer delivery of all our reclaimed roof tiles to anywhere within the UK, at very reasonable rates, with a friendly and convenient service. To make things easier we are also able to offer a demountable fork lift truck service on all deliveries, enabling the safe and efficient offloading of all of your second hand roof tiles on site, no matter where the delivery site. Whatever the job, at All Slates we’re here to help. 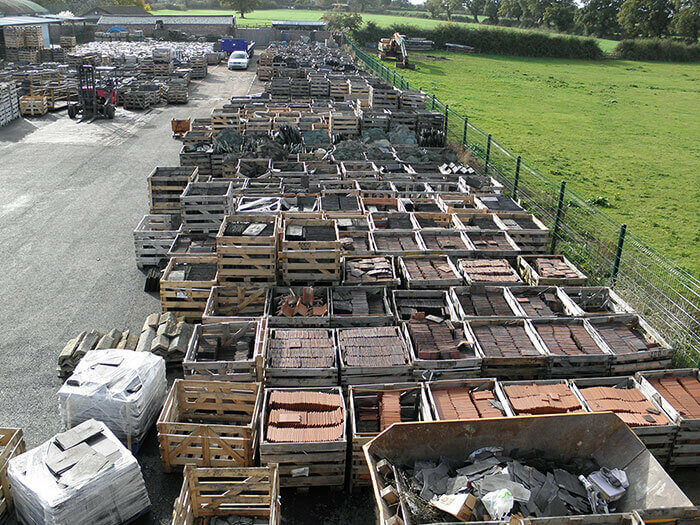 We hold a very large stock of all our reclaimed roof tiles onsite, with something to suit all needs and requirements. If you have any queries about the types of reclaimed roofing tiles we offer, phone one of our advisors on 01829 262 600, fill in our online query form below, or alternatively visit our Cheshire site, and we will be happy to provide helpful advice on the best tile for your requirements.